Over at illuminea.com, we manage over many WordPress websites as part of our WordPress hosting and maintenance service. All of these sites need version upgrades, plugin upgrades, and the rare theme upgrade (since we never use the default WP themes like TwentyEleven). Amazingly, there are 3 services that make mass upgrades possible in a few seconds (more or less). ManageWP was the first of these management tools that I tested and it is definitely the most robust – they’ve really thought of everything. For better or for worse, you manage your sites by logging into their website. And, unfortunately, it is the most expensive of the three options. There is a free account for up to 5 websites but it only includes the “Standard” features which means no scheduled backups – a pretty major drawback, in my opinion. To see the different pricing packages, go to their Plans and Pricing page and then at the bottom click on “Standard,” “Professional,” or “Business” pricing and you’ll see a chart that shows how much it costs according to how many sites you want to manage. It gets expensive very quickly. For example, managing 50 websites with the Professional features costs $67 a month. These buttons are tucked away at the bottom of the Plans and Pricing page. ManageWP’s interface is a bit cluttered. Bottom line: ManageWP offers the most features out of all the services reviewed here. But my two main concerns regarding ManageWP are that you’re so dependent on them to always be around, and they’re quite pricey. My initial impression of WPRemote was that it’s so cute! Its user interface is very simple, clean and user-friendly. Until I started using it. WPRemote lets you upgrade themes and plugins from their dashboard, but their service doesn’t include bulk WordPress upgrades. You need to leave WPRemote and go to into each client’s website separately to upgrade it. Ugh! Regarding backups, WPRemote lets you back up to their Amazon S3 account, but as of now, there isn’t a way to backup to your own account, which is pretty annoying. Bottom line: For a free service, it’s pretty good, but definitely not robust enough for our needs. The fact that it doesn’t allow backups to a service of your choice (like Amazon S3, Dropbox, or even FTP to another server), or real bulk WordPress upgrades, could be a problem for many website managers. I saved the best for last! InfiniteWP is a little trickier to set up because you need to upload files to your server, but it is so worth it! First of all, InfiniteWP is FREE! And, second of all, since you’re hosting it on your server, you’re not dependent on a third-party service and you have more control over the security. And, guess what! InfiniteWP is FREE! 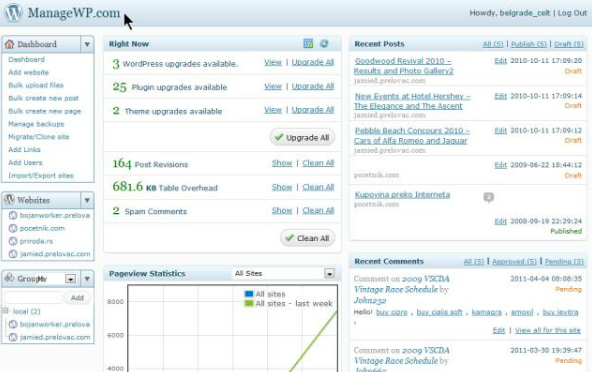 I love that you can easily do theme, plugin, and WordPress upgrades by just click, click, clicking around. And if you don’t want to upgrade something, you just click the “hide” button to remove the temptation of the “upgrade” button. WordPress in a subdirectory: I couldn’t add the InfiniteWP Client plugin directly from InfiniteWP’s “Add a site” area on sites that have the WordPress files in a subdirectory like http://example.com/sitefiles. To resolve this, go to the site and install the plugin from there and then add the site to InfiniteWP. Multisites: When adding a site to InfiniteWP, you have to fill out the URL, Admin username, and the API code (which you get after installing the plugin). When I added a multisite, I entered a Super Admin’s username but it didn’t work. I then added a regular Admin and then it worked. fsock error: Sounds silly, but it really is the name of an error I got when I tried to add InfiniteWP on a password-protected directory. I removed the password-protected directory and then InfiniteWP started working properly. Backups: Currently, backups are only available to your own server, which is a problematic way to back up a site – if the server goes, you lose both the site and the backup! I would love to set backups to go to our Amazon S3 account, but when I contacted the developers, they said that this feature will be added in the future as a premium add-on. Oh well. Luckily there are other alternatives for backups like BackWPUp. Hard to find the list of websites: After I added all our sites to InfiniteWP, I wanted to look at all of them to make sure I didn’t miss any. Only after the developers pointed out the little “W” hiding in the corner, did I find the list of websites. Hello cute little orange “W”. Bottom line: InfiniteWP is an amazing, robust and free service. It might not be for everyone due to the need to install it yourself, but for those who want control, that ability is actually a big plus. The biggest, and pretty much only, drawback is the inability to back up sites off-server, but hopefully they’ll add that service soon as they said. What has your experience been with multiple-site management tools? It’s amazing that there are such great options for managing multiple WordPress sites springing up left and right. Let the competition continue! WordPress in a subdirectory: I couldn’t add the InfiniteWP Client plugin on sites that have the WordPress files in a subdirectory like http://example.com/sitefiles. To resolve this, go to the site and install the plugin from there and then add the site to InfiniteWP. What do you mean you couldn’t add the client plugin? How? Of course you have to first go to the site and install the plugin, what other way is there? I didn’t have any problems with a super admin account. Worked jsut fine. Hi Ovidu, I couldn’t connect the site to InfiniteWP from InfiniteWP itself in the “add site” area. I had to go to the site to find the plugin and then it worked. As for multisite, that was my experience with the admins vs. super admins. I’ll see if these issues happen again in the future. Sure, but as to the “connect” issue: that is how it is supposed to work: install the InfiniteWP client plugin on a site, activate it, make a note of the KEY, go to your install of InfiniteWP and add the site using an admin user, the URL and the KEY you noted. No other way for this to work. When you add a site in InfiniteWP at the bottom it says: The IWP Client Plugin should be installed on the sites before adding them. I found it to be much faster to add the plugin by clicking the “add site” on InfiniteWP. It then tells me I need to install the plugin which I did by clicking “install” and then it takes me to the plugin page ready to install the plugin. But with sites in a subdirectory, I couldn’t do it that way. Not a big deal, but something I noticed. I prefer to use SVN for updating plugins, themes and core. It’s faster, more reliable and has proven itself over many years of use. It worries me using some of these external services as they require a disturbing amount of access to do very basic things. I haven’t found a good way to back things up just yet, so mostly stick with BackupBuddy and fire everything off to Amazon S3. It does fail on very large databases though unfortunately, so is not ideal for many instances. Thanks for the tip Ovidiu! I didn’t realise that wasn’t an external service. Having leveraged these solutions myself, I’ve found InfiniteWP to be an excellent choice providing significant value among critically important facets. While it’s competitors have had an opportunity to mature in the ever growing WordPress market, InfiniteWP will be releasing premium features which will address what was identified as short-comings. For example, while backing up on one’s own web-hosted server isn’t a robust solution, I understand from their team that they will soon release a number of premium solutions (e.g. backup to the cloud) which rounds out the solution quite nicely. Note – these ‘premiums’ would be offered at a single-fee lifetime license. We’re not talking about recurring fees here! Having quickly added over 70 websites and several hundred more on deck to be added, I feel a lot more confident knowing that my successful niches are not readily visible to others. So – I can enjoy the benefits as well as keep my sites ‘close to the vest’. WOW, thanks Paul, thats a new one. At a first glance it sounds great and the pricing is really competitive compared to managewp but I think I’m gonna stick with InfiniteWP simply because I can host it on my own server. The only reason I can see why I would change to worpit would be after InfiniteWP announces its commercial add-on prices. IF those are not aligned with the other major players I might switch to worpit. Yea, it’ll be interesting to see the costs for sure. I guess things like this are always a balance between the cost and the amount of work to maintain/use them. I prefer now, where possible, to not have to manage the tools that I use to manage, if that makes sense. Infinite has it’s own expertise/management overhead that something like Worpit wouldn’t have. Thanks for the post and review of these 3 options. We’re in the process of evaluating the best (most secure) methods to manage dozens of client sites. Thanks again. Agree with you Matt – security is right at the top of my list of requirements. I love the idea of being able to manage all my sites and client sites from one interface, but have reservations about the service still being there a few years down the line. I can’t see how a free service can keep providing the service, and if you are relying on them for all your sites!!! Are you actually using InfiniteWP or were you just trying it out for the review? IWP is not a service, you install it on your own server and they make money by selling add-ons to the free version of their software. How many sites do you manage? Since Ovidiu posted about it here, I’ve tested and used this service myself on around 50 sites. It seems to work well. I know of a lot of highly skilled WordPress developers who swear by it too. Just make sure you lock down the install well as if that gets hacked you could land yourself in a whole pile of mess. Ryan, is there anything specific that you do to lock down IWP? By the way, the more we use it, the more we love it. For example, the update emails it sends are so useful, and pretty! Miriam, I didn’t set it up myself, but one of my colleagues set it up on it’s own server which blocks all external IPs apart from the ones we specify and it has it’s own authentication certificate. I don’t much about how to set up that sort of thing or how it works, but if you are interested I can track down the details for you. As soon as I have ALL websites security routed through a single point I start to get really paranoid. That one single point of failure would be catastrophic if someone figured out how to hack into it. I’m only using IWP to manage about 18 WP sites and it works flawless for me. Appreciate you taking the time. i use managewp for 25 sites and now i need a few more and i found this review. thanks about that. i like that iwp was an install on my server. like to hear about your security details. I’m sure you know this by now, but they offer premium add-ons now, and one of them does exactly what you want it to. It backs up to Amazon and other services.